MyPhone surprise us with their latest addition of MyPad series that is now on the 4th version. The new MyPad 4 now made to attract gadget lovers who wants affordable tablet with great specs. They cut down to size to 7.85 inch from their previous MyPad 3 that was built in 10-inch wide screen size. Though the device now comes in a smaller screen, the power and features are still amazing and competitive to other local tablets Cherry Mobile, Starmobile and Cloudfone. 8- megapixels rear shooter – you can take good photos using this tablet on both rear and front cam. The 5-MP secondary camera is already decent feature for selfie addict and video calling. USB OTG support – not all tablet support this feature but with MyPad 4 you can USB OTG cable for your files, flash drive, camera and other devices. Processing power – this tablet is powered by a new variant of Mediatek quad core processor that can handle smoothly on task that you like to throw on this tablet. Added to that is the 1GB RAM helping the tablet to render needed processing space. Connectivity – any connection type is not an issue with MyPad 4, you can connect using cellular network as it has a single SIM card slot that support high speed internet data (HSPA+). All you have to do is register to network unli internet promo then configure the correct APN settings then you’re good to go. 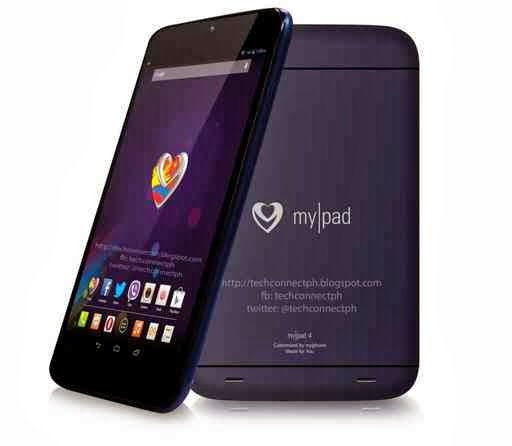 MyPhone Tierra MyPad 4 tablet price is below 10,000 pesos and is now available on some outlets and resellers. We also spotted MyPad 4 case on sale at Ebay, for those who want an added accessories on this tablet you can check out your favorite online store and sites.